aroline Bendix is an accredited freelance library conservator with 33 years’ experience, working for major national conservation bodies, (many on a continuing consultancy basis), cathedrals, churches, synagogues, learned societies/institutions, museums, historic houses, private collections, universities, municipal collections, schools, the Government, Historic Royal Palaces and independent libraries. Continuing consultancies to English Heritage and other organisations, such as the British Library Preservation Advisory Service/BLPAC (formerly the NPO), All Souls College (Oxford), Eton College, the Royal College of Physicians and Rochester Cathedral. 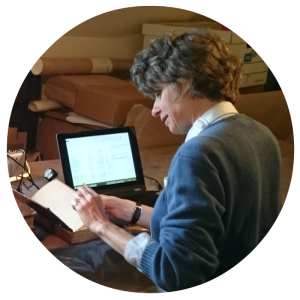 She has written three of the preservation leaflets for the BLPAC and teaches courses on damage recognition and cleaning collections for them.